There are a lot of misconceptions about Cornish Cross (or Cornish X) chickens. I’ve heard them called Frankenbirds and GMO chickens…they are neither. I guess a Frankenbird would be a chicken that has been sewn together from parts of different chickens…not a viable way to produce a chicken, quite ‘frankly.’ Genetically modified chickens would be chickens that have had their genetic material altered by adding genetic material from other organisms in a laboratory setting. Cornish X are actually produced by hybridizing chickens, resulting in a bird that is the genetic offspring of several distinct breeds. The hatcheries that produce these chicks guard their secrets very closely so that hobby farmers, like me, aren’t able to copy them and come up with a home raised Cornish X. 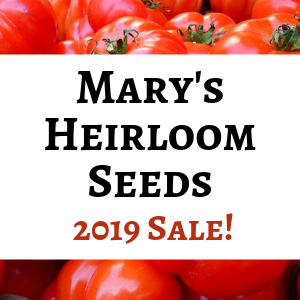 The breeds used in this hybridizing program include White Plymouth Rock and Dark Cornish, but that’s as far as I’m privy to the whole operation. Why would anyone want to raise these ‘freaks of nature?’ Mainly because they grow fast and produce a nice sized, tender roasting bird in about 2 months. This means that the cost of raising these birds is lower and the result is a meaty bird…just what consumers want. Mainstream America is used to the meat of the Cornish X…it’s the only kind of chicken you can buy in the grocery store these days. On the opposite end of the spectrum are heritage breeds. These are dual purpose chickens that lay a decent number of eggs and the extra roosters will grow out to a nice dressing size in about 6 months. The problem with raising heritage breeds for meat is mainly the length of time needed to grow them out, and the cost of the feed they consume in the process. Some folks swear up and down that these chickens are more flavorful than the Cornish X, and others swear up and down that these heritage birds are tough and stringy. I think both camps have a point. I’ve butchered many chickens, from the tender Cornish X to Black Broilers, from old stewing hens to young heritage roosters. I find it to be very true that the older a chicken is when you butcher it, the tougher and more flavorful the meat will be. I don’t necessarily find the flavor to be better. To me, it seems a bit more like dark meat…and I tend to like the flavor of white meat best. Last fall I decided to order a batch of Black Broiler chicks rather than the Cornish X to butcher for the winter. I had a rather high mortality rate, even without a possum attack. I finally got tired of feeding the little blighters after 4 months and butchered them for the freezer. The largest weighed less than 3 pounds. The feathers were black, which made the dressed birds less appetizing. We don’t mind that much, but I’m sure many people would prefer not to have little black feathers left on their chickens. The Black Broilers were probably a bit faster growing than some heritage breeds, but they paled in comparison to the Cornish X. This year I am going back to the Cornish X for my meat chickens. I can expect to have birds dressing out to around 5 or 6 pounds each at about 8 weeks of age. This will allow me to grow out 25 or so chickens and have them in the freezer before the weather heats up too much for the young birds. There are some things that you need to keep in mind if you decide to raise the Cornish X. They need to have their food and water in easy reach. If they have a coop with access to pasture, be sure that they have food and water in the coop and outside in the pasture. If the sun is too hot on them, they will stay in the shade of their coop rather than go searching for water outside. Don’t give them roosting bars. Roosting on bars can cause a thick spot or blister to form on the breast of these birds. Be sure they have a shady place to rest. Their feathers won’t cover their skin and they are susceptible to sunburn. Follow the hatcheries instructions for feeding. These little feathered piggies may eat too much if they have unlimited access to food. Hatcheries will give instructions for taking their feed away in the evening to prevent overeating and heart attacks. Don’t ‘chicken out’ when it is time to butcher the birds. These chickens will not live long, productive lives if you keep them around as pets. The size of their bodies will outweigh their skeletal and cardiovascular systems’ ability to cope. I have heard of broken legs and heart attacks causing early death in Cornish X. I’ve never seen this happen in the ones I raised, but I don’t doubt that it could happen. If you are a proponent of ‘slow food’ or heritage breeds, by all means, order some good old fashioned dual purpose breeds of chickens. I have found the Buff Orpington, Barred Rock, and Black Australorp to be fine birds for eating. Order straight run so you’ll have some laying hens too. Just be prepared to keep your roosters around for about 5 to 6 months if you want a decent sized chicken for dinner. If you would prefer to raise a quick flock of meat birds in about 2 months and have a lot of tender breast meat, then Cornish X are probably your best bet. There is another hybrid available called ‘Freedom Rangers,’ but from the reading I’ve done, these hybrids are similar to Cornish X. They might be a bit slower growing and have brown feathers, so keep that in mind if you are thinking about trying them. I can’t speak from experience, since I haven’t tried raising the Freedom Rangers. Although some folks think that raising Cornish X chickens is not humane, I must say I don’t see it the same way. Raising your own chickens at home allows you the opportunity to raise them in clean conditions with access to pasture and fresh food. You have the ability to butcher any bird early if they are getting too heavy for their skeletal structure. I am happy to know where my chicken comes from and that it isn’t mistreated or fed antibiotics before I eat it. How about you? What is your favorite breed of meat chicken? Do you prefer the fast growing hybrids or the heritage breeds? Love all your informative posts! We just processed 22 turkeys for the first time this past weekend and filled our freezer! We are now seriously considering doing a batch of meat birds. One of my concerns is roosters and their crowing. We live on just under 2 acres and have neighbors around us and I don’t want to give them anything to complain about. 🙂 We didn’t have any complaints about our turkeys although they weren’t crowing in the wee hours of the morning. Did you raise straight run birds? Will the roosters fight with one another? Is there a big difference in the quality or tenderness of the meat in roosters vs hens? Thank you, Holly! I’m glad to be of help 🙂 22 turkeys…that’s awesome!!! Congrats! If you are ordering the Cornish X chickens, they will be ready to butcher before the roosters start to mature and crow. I have also raised Black Broilers and they were starting to crow by the time they were big enough to butcher at about 4 months. The Black Broilers dressed out to around 2.5 to 3 pounds each, compared to the Cornish X that dressed out to around 5 pounds at 7-8 weeks. There are a lot of choices for meat birds that grow more slowly, such as the Freedom Rangers, Red Broilers, and such…I haven’t tried any of them, but I suspect that the results would be the same as I had with the Black Broilers from Ideal Hatchery. So, in short, if you go with the Cornish X meat birds, you will have no problems with noisy roosters. Best wishes and please let me know how everything goes if you raise meat chickens this year! Thank you so much for your input! This helps a lot. I ordered my turkeys from Ideal, so I will probably go with them for the Cornish X. Another important question, what about vaccinations when you ordered your chickens? I did not add on any vaccinations for my turkeys from Ideal. I don’t order the vaccinations for the meat chickens because they are butchered before Marek’s is usually an issue and I’ve never had any problems with the coccidiosis. But the cost is only around 20 cents each, so if you are concerned, it isn’t a big cost. Also, I don’t know where you are located, but I’ve had good luck with Cornish X from Sunray hatchery in Iowa and they are cheaper than Ideal. Mom and Pop operation so you may have to wait longer for delivery…but I’ve had good luck with them. My baby 4 day old corish rangers are in a barn that reads 82 deg. The barn feels like an oven? I would put another thermometer out there to double check the temp. It should be warm, but if it feels like an oven I wonder if your thermometer is correct? 4 day old chicks should have temps at about 95 degrees Fahrenheit. I hope this helps. I mistakenly got some Cornish X girls this spring in with a batch of other chicks I was picking up. I don’t raise meat birds so didn’t need crazy accelerated growth so I just fed them the same feed I give my other girls. I did research on them and was told they would be lazy and gluttonous, but those 3 rock crosses are the most active of all my birds well able to fly ten feet up to the top of my shed! As long as they don’t develope any health problems I’ll be keeping them as layers for awhile, but they definitely aren’t what I expected after all I read about them. When they get regular feed and exercise, they can really be good birds to keep. I kept one as a laying hen. She did eat a lot more and got quite large, but she also laid eggs for me too. 🙂 Best wishes with yours! Most broilers are actually Cornish X Rock chickens that have been hybridized by the poultry industry. They were originally a cross between Cornish Dark and Plymouth Rock chickens, but have been further hybridized. It’s possible that you’ve been raising the Cornish X all along! Meat birds are a great thing to raise I’m 15 and I see the benefits of learning how to raise and butcher them. They sure are a good bird to raise for money and for food. That’s great, Gracie! It’s always to see young people taking an interest in self sufficiency and doing for yourself. 🙂 Thanks for stopping by! Sorry it posted twice! My computer is being stupid! Livestock gaurdians are indeed another way to protect your flock. 🙂 Thanks for sharing. Meat chicks, like any other chicks, need to be kept in a warm, dry enclosure until they are fully feathered out. The rule of thumb is: Keep them at 95F for the first week and reduce the temps by 5 degrees until they have their adult feathers. Hatcheries (as far as I know) don’t sell the meat birds at older ages than day olds, unless you have a local hatchery that specializes in started birds. But, considering that the Cornish x are butchered at about 7-8 weeks old, it seems unlikely that you’ll find them started. You could try looking on Craigslist for your area to see if anyone around is selling meat birds that are close to butchering age. If you have predators in your area, then it is likely that they will find your chickens. Raccoons and possum will dig under a fence, so it is best if the fence is buried or their enclosure has a wired bottom to keep them out. And yes, hawks and owls will take your chickens too…so you might need fencing on the top of their enclosure too. You might want to check out the chicken tunnels like Joel Salatin uses for his meat birds. Best wishes! Lisa Lynn, Thank you for your post about raising meat birds. (I know it’s not a recent post. I just happened by it today..again.) We raise Cornish Rock X and have had to “defend” our choice and explain they are not GMO “Frankenbirds”. I’m glad your info. supports what we found too. Glad to share 🙂 I know that there are many people who prefer to raise heritage birds for meat, and that’s great. You just have to go into it knowing that they will take longer and they won’t be like the chicken you buy at the store. I’ve raised them and I eat all the extra roosters I hatch out. But there really isn’t anything that compares to the Cornish X chickens for raising great meat for your table. 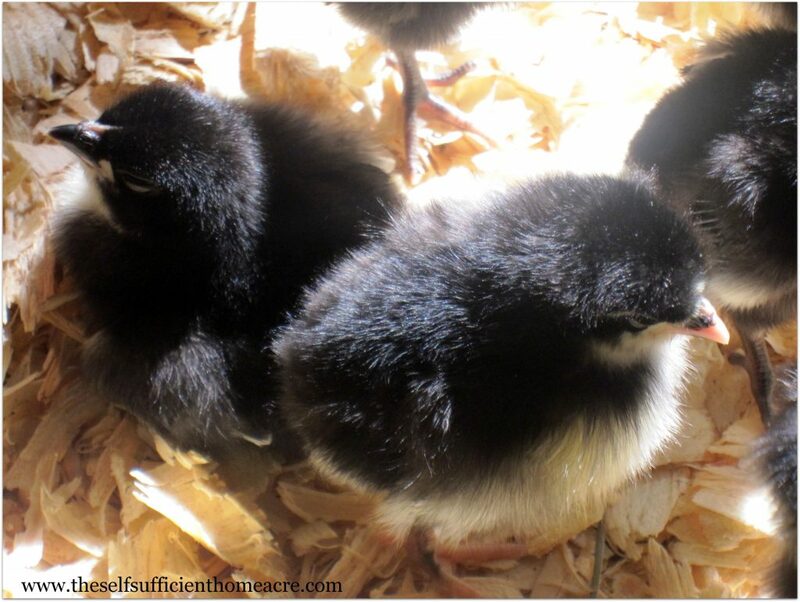 I’ve gone back and forth about buying them from hatcheries, because many hatcheries don’t treat the chicks very humanely…but at least I know that the chickens I raise have an awesome life compared to anything you can buy at the grocery store. And yes, Frankenbird is a total misnomer! I wish people would do some research before they start throwing terms around. Thanks for stopping by and commenting, Sally. I really do appreciate hearing from you! I have a trial breeding program going at the moment. My breeding hens are from Sussex light rooster over white leghorn hens, you get a fairly okay sized bird that lays a very good amount of eggs. And my breeding rooster is from an Indian game cockerel over buff Orpington hens, you get a large breasted bird with a wide stance and generally heavy. My hope is to get quite a large bird with good egg laying capability. Thanks for the info, Joe. I haven’t tried the Sussex or Indian game breeds, but they sound like good birds to raise (someday! )…Let me know how your experiments come along, because I’m very interested in raising all my own birds at some point. You Rock Girl! Keep going and don’t let anyone discurage you!!! We moved 2 years ago to 40acres who had only seen a “Brush Hog”. Slowly we tuning it into a farm. We started with dual purpose chickens like Buff Orphingtons, Barred Rock, Black Giants, Speckled Sussex, New Hempshire Reds and Araucanas (for fun green eggs). I love the different breeds, its easier to check on them and to count them when in from free ranging. We will try some meat birds this year, it’s a lot of work to butcher and clean (which I am proudly doing my self – Girl Power! ), and I like a bit more meat on the birds in a shorter time. Otherwise it is not worth doing. Why, thank you very much, Marion! I don’t often get discouraged by comments 🙂 I know that I’m opening myself up to very different opinions by sharing my experiences…it’s ok, I’m getting used to it. It sounds like you have a great place to homestead! With my one little acre I’m just a little bit jealous 🙂 Keep me updated on how things are going…I love to hear about other peoples’ homesteading projects! hi I am Jason from Iowa as well just got our first chicks this year let me know how you are doin. The kids picked out 25 mixed brown egg layers and 10 red rangers delivered march 10 2015. We ordered 40 more reds april 20 2015. Maybe a little slower to grow but we are having so much fun with our first batch. With this avian flu in the mid west [Iowa} we got our small flock at the right time. Congrats on the new chicks, Jason! I haven’t tried the Red Rangers, but I’m hoping to try them someday. Right now I’m growing out 10 turkeys for butcher this summer. Maybe this fall I’ll get some more meat chickens. Let me know how you like your meat birds! We had raised araucanas and buff orphintons for meat and eggs and feathers when I lived in Missouri. A phone call came in one afternoon asking if we wanted a big white chicken that the neighbors of my roommate’s dad had abandoned. When I heard that the neighbors had left 2 months before, I asked how the chicken was surviving? “On cat food that we take over because we feel sorry for it. But it’s trying to crow, so it’s becoming a nuisance. Please come up and get it and put it in with the rest of your chickens?” I was expecting a rooster that looked something like a cartoon charicature of a chicken. Instead, this huge, rather lame, bright eyed chap came looking for something to eat right when we came to the back yard gate. I’d brought a cat carrier sufficiently sized to hold my kitty, and just stared and asked roomie, “How the hell are we going to get that thing home? HES HUGE! What was in that cat food?” And so, my first experience with Bob, the Biggest Rooster in the Whole Wide World had begun. We finally held Bob up by his feet and dangled and folded him into the cat carrier.. barely. Please don’t dis, we did the best we could under the circumstnaces and it was only a 20 minute drive. Once we got home, we unfolded Bob out of the cat carrier and he was so pleased to see a back yard and MORE Chickens.. that he went right up to the run gate and waited patiently to be let in. The araucana roosters wanted NOTHING to do with him, so we rescued Bob and decided we truly had a yard bird. As the summer wound down, and we got a fix on Bob’s age at about 15 weeks of age, it became apparent we had an “What do we do about Bob” issue on our hands. He was having trouble navigating, his feet were becoming more lame, he couldn’t roost anywhere but on the front step of the house, and it was agonizing watching him try to negotiate even that. We had taken to calling him Blob, instead of Bob. And it was time to butcher the poor darling. That was done quickly and humanely, and with thanks and a whole lot of curiosity about what I would find insided! He dry plucked very easily, and when it came time to remove the innards, well.. they were normal, size and the amount of internal fat was comparable to any other meat bird. The difference was just the amount of meat available on our Blob. After I got him cleaned and cooled we weighed him, and he came in just over 15 pounds. He tasted delicious! And so, I would say that a diet of cheap dry cat food had not done him any harm at all for those two months he was left on his own in the backyard. By the way, Bob didn’t tear up the backyard of his original home, but you could tell that he was lonesome. He was pretty happy with the final 3 weeks of his life, and we were happy to have him for dinner for several meals. I’ll do CX again, with no problem or hesitation! I’ve taken the more longterm approach, and gone to the extreme of having my hens hatch and raise chicks. It takes a minimum of four months before these birds are ready to be butchered. They are a very different product than the cornish cross chickens. Using the same word “chicken” seems inappropriate. I like to make the comparison that the cornish cross chickens are like eating white bread and the slow-growing heritage chickens like eating wholegrain bread. The ones with truly outstanding flavors are the six month to year old roosters. You have to treat these birds very differently. It helps to age them in the refrigerator for three days to a week. Cooking them at a low temperature, 200-250, is good. The meat is much firmer but juicier. What is spectacular about them is their fat. My birds spend their days outdoors. They are out of their coop at the crack of dawn and in the summer don’t go to bed until very late. The mothers start taking their chicks outdoors within a week, sometimes after just a few days after hatching. So these chicks grow up foraging for food all day and roaming great distances. I’m glad to hear that you have found a system that works for you and doesn’t support the hatcheries that kill 🙂 I enjoy the young roosters that I butcher. The older hens are used for soup. I am slowly using up all the meat in our freezer and plan to raise my own for meat. Thank you so much for the information!!! I really appreciate the info on your blog! I’m so glad I found it. No problem, Brooke! And thanks so much for reading and commenting 🙂 The black broilers are a hybrid that is sold for raising meat. (I ordered them from Ideal Hatchery). They took quite a bit longer to reach butcher size and didn’t get nearly as big as the Cornish X. But they acted like regular chickens and were easy to take care of. I am new to your blog and must say I LOVE it!!! So much good information for people who are trying their best to live sustainably. I would like to get rare breeds of chickens to try. We plan to have my daughter’s class hatch them out and then move them to my dad’s farm. This way the kids will get to watch this incredible process and we have the chicks going to a farm . I loved reading all the information you offer Lisa Lynn, and that of your readers too! It is wonderful to receive information from so many knowledgeable sources!! I can’t wait to start my own flock and love the idea of raising birds that are multipurpose! I have also read that chicken’s help take care of tick problems and here in Delaware and Pa, where my father is ,are prime Lyme Disease areas. So that will be the only positive thing about ticks, that they help provide our flock with “Protein?”! Thank you so much for reading my blog! I’m glad you found me 🙂 I think it’s awesome that you want to raise some of the heritage breeds of chicken. There are so many worthy of conservation! And what a great idea to hatch the chicks in school and take them to your Dad’s farm! If you have a problem with ticks, I’m sure that chickens will help a great deal. You might also want to check into Guinea fowl too. They are noisy, so I don’t think I can keep them here, but they are supposed to be great for tick eradication. Best wishes with all your projects! Thanks for reading! Hi!! I am a big fan of your page and lots of respect for you and others for doing this and being so self sufficient! A question for you… My property is not big enough or equip for chickens, etc. Do you know if farms keep chickens for me and have a place I can butcher there? I am trying.to leave to be more self sufficient for my grow family but I need to know how exactly to start or my options. Thank you so much! ! It’s so hard to know about what is available in your area. You might want to start by looking on Craigslist to see if there are local farmers who sell processed chickens or offer services such as allowing you to use their barn or coop. If you have some farms in the area, see if you can get to know the folks. Don’t expect them to be excited about having a newbie try to raise chickens on their property! Remember to ask a lot of questions to make sure that you are happy with the way they want to handle the arrangements. I would be concerned about keeping animals on a farm if I didn’t know the folks well. You might want to check into hunting in your area. Are there public lands that allow you to hunt? What are the regulations? Do you know how to hunt and operate a hunting rifle or shotgun safely? You can also grow more sources of protein in the form of dried beans and peas, raise rabbits for meat, or barter with folks you know. Let me know if any of these ideas help! Best wishes with your quest for self sufficiency! Sounds like you’ve got a good system going! I’ve thought about freedom rangers too, but haven’t tried them yet. I do like how fast the Cornish X grow and how meaty they are. Right now I have so many chickens in the freezer, I think I’ll wait before I raise any more! I raised Cornish cross three spring/summers. I would do about 20 to 25 in a batch and offset it so that I had two batches going at once since I had a small coop and a bit larger coop. I start them in the small coop and move them to larger coop about 4 weeks, and then by the time the first batch goes to the place to be processed, I then move the younger batch into the larger coop. I have lots of pasture but they are rarely interested in it. I am going to try putting them out on the grass first thing and then feed later. I am going to also withhold feed at night until morning. I get the birds from a local hatchery/family farm in Fort Plain, NY and they seem to take very good care so I like ordering from them. I had thought about Freedom Rangers so I’m on the fence about this. My birds were usually 4 to 5 lbs. in 6 to 7 weeks. I feed only Poulin grain. I talked to the company and they get most of their grains from Canada so there is less likelihood of any GMO’s. I was very happy with the quality of the feed. I did find out though that Cornish will not go out if there is no shade, so I bought black mesh tarp like netting to put over their run and then they’d go outside. Awesome post! We’ve been raising Cornish X’s for 3 years now, and haven’t had any real problem. We house them in a 10×10 tractor that gets moved 1-2x day. We have found too that to help with feed costs, we’ll move the tractor first thing in the morning to new grass, and they go nuts! They eat like there is no tomorrow. About an hour or two later we’ll put their feed in, and maybe half of them will come over and eat, and the rest will take a break, assuming their bellies are full from the grass. It has helped cut our feed costs by about a third since we started doing this in our second year. Our birds were fairly active, until their last couple weeks, then they would rather rest. This past year our fully dressed weight average for 45 birds was 7.5 pounds in 9 weeks! And in total we lost 5, 4 in the 1st week, which I guess is to be expected. Thanks for sharing! Awesome blog that I enjoy following! Thanks, Zach! Great idea to move the chickens, let them eat grass, then feed them later…I need to try that…when we have grass again, of course. Thanks for sharing…I always enjoy reading about what has worked well for other homesteaders. 🙂 Keep up the great work! I’ve taken another approach to raising chicken for eggs and for meat. After one of my hens laid and hatched a clutch of chicks and observing how much care she gave her chicks and how much her chicks loved having a mother, I switched from using hatchery chicks to specializing in mother-hatched, mother-raised chicken. It takes four to seven months for these chickens to get to butchering size, but the taste is well worth it. I also prefer the texture of the meat. By using mother hens, I don’t need to use heat lamps or get chick starter feed. The mother hens keep the chicks warm and grind up grain for the chicks. It’s amazing to watch. I’m also convinced that what makes chicken taste really good is letting them exercise as much as possible. I’m on five acres and the chickens roam a long way during the day foraging through pasture, brush and woodland. I love to raise chickens! This is my first time with Cornish X. I don’t kill my chickens; they become pets. Cornish X chickens (I have only four–2 roosters and 2 hens.) have been pets from day one! They are beautiful–Moe Moe, Joe Joe, Lucy and Salley. And the cross of the Cornish cross is always changing. If not , the growth and size will slow. I worked for foster farms and they were always changing the genetics. Their Cornish cross is done and being butchered in less than 6 weeks. I’ve read that they are constantly tweaking the genetics…but I don’t have first hand knowledge about it. Thanks for sharing your experience! I have raised chickens for way over 30 years. If you skin when you butcher, then you don’t have to worry about the dark pin feathers. Plus , butcher time is a little over a minute a bird. I grow Cornish cross for my earlier butchuring . The rest are pioneers and other breeds. They free range on 30 acres. We butcher about 400 a year. Also raise muscovy ducks for our jerky, summer sausage and more. That’s a lot of chickens! I have skinned chickens instead of plucking…especially if I’m just butchering 1 or 2 and I don’t want to pull out the scalding pot. But I felt like I was wasting the skin…which I feed to the dog after cooking. The skin helps keep the meat moist while roasting, and helps to protect the meat from freezer burn if it’s in the freezer for a while. However, older stewing hens are often skinned instead. Thanks for sharing your methods! Your muscovy jerky and summer sausage sounds yummy! I was googling “fast-maturing poultry” to figure out what other breeds I might want to add to my flock and after reading what I’ve just read in multiple places (here included) I’m now surprised that the black australorp isn’t near the top of the list. My boys are about 7 months old now but they were already the size of a small turkey 3 months ago and bigger than a red star rooster when they were just 4 months. I’m knocking off two of them this week, each one should be able to provide at least two suppers for my family! The hens aren’t nearly as big, though, but they won’t become dinner until they quit laying. Ahaha… I just noticed my math, lol! Recalculating now…. k, the turkey-size bit was wrong. They got that big about a month/2 months ago, so around 5/6 months of age. That’s really good to know! Thanks for sharing. 🙂 I have only had Black Australorp hens, and they were decent as dual purpose layers. I butchered most of mine when they were in molt last year. Beautiful birds…loved their shiny black feathers. But I haven’t had any experience with the roosters. I’m not sure if I’ll be ordering any chickens any time in the near future (probably only if I have another possum raid on the hen house) but I’ll consider getting straight run BAs if I do! As chicks, they got carried outdoors to a modified rabbit hutch each morning (I removed the floor) and were presented with a small dish of chick food. The rest of their growing-up diet was clover, grass, weeds, and ants (oh my, they LOVED IT when I put them on an anthill!) When they outgrew the hutch i built a portable dome of plumbing line that i found laced through bird netting and then tent poles laced crosswise through. That way they were outdoors dawn to dusk with the elders but separated. After about 3 months i wound up just giving them layer, only because i knew they’d make up the additional protein in ants, lol! Although they grew quickly, I don’t think they grew as fast as they were supposed to. The lady I bought them from said her hens laid the day they turned 16 weeks, but Gonzo – the only girl of 8 babies, grrr – didn’t start laying until about 6 months. Recently I added grower to their diet because of the amount of boys I have (6 total and only 12 hens) and also I read that phoenixes, which make up half my flock, require extra protein for feathers. So, I give a dish of each in the morning and let them out in the afternoon. (If they haven’t escaped already. Btw, despite their impressive size, the BA roos can clear a 4′ fence in vertical flight!) Now that we’re into winter and the forage is not great I give a supper of fermented rolled barley. I’m contemplating fermenting their other feed as well, since of the 3 bags started around the same time, the breakfast bags are nearly empty while the barley bag is maybe down about half! I do want to get into mixing my own feed, though, because the grower is loaded with corn and soy, two things I’m actively working to avoid in my food (GMO, you know!) and the organic feed is like $40/bag here versus $15/bag! The fermented barley is good…I’ve read that sprouting and fermenting are good ideas and I’d like to get into that myself. Just been a little busy lately! 😉 You can buy split peas or field peas to replace the soy. I’ve also given sunflower seeds, the fats and protein may help replace both the corn and soy. I switched to organic feed but I’m only paying around $22 for a 40# bag…still high, but I feel a lot better about eating the eggs and meat. But it’s hard to find organic meat producer feed. You might want to check around to see if you can find another source. Also check to see if you can order from Azure Standard…a buying club supplier out of Oregon. They ship all the way to Indiana now…so maybe they come to your area. They sell organic feed. So it sounds like your meat birds grew big pretty quick without meat producer feed or any special treatment, which is good to know. I will stash that info away into the old brain pan for future use! Thanks for all the details…love it! *sigh* I think buying the organic would be cheaper than ordering from the states. Their eating only goes crazy in the winter months, summer there’s loads of good stuff in the yard and forest plus longer days to forage. The fermenting is super easy: a bucket of sorts (i use a small pail that came with a house plant I bought), dump grain to a few inches below top, fill with lukewarm water, dump in a splash of acv and/or the liquid from yogurt, stir and let sit for the day. When it bubbles when you stir it, it’s done; that’s when I move it outside. Stir once daily and when it gets down to where you can’t scoop anymore out easily, add more grain and top up the water (bringing it in to sit and do its thing for the day). Thanks for the instructions! I’ve started my own sprouting, fermenting process now. 🙂 I meant to sprout, but sometimes they ferment instead, lol! Either way, the chickens love it. I hope you heard back from the fishmeal source and it works out for you! Best wishes and thanks for sharing! To report back on my earlier experiment. I bred a Black Cornish rooster with White Rock Hens, hoping I would get a meat-type chick. It was a resounding failure in my eyes. I kept the chicks for 4 months feeding starter and then grower and by then they were still only “broiler” size (about 3-l/2 ). When butchered they ran about 2lbs and definitely looked like the broilers in the store. However, they were not tender (even though they were not pastured – they were kept in a large coop so didn’t get a lot of exercise as our laying flock does). I have brined them in salt water before cooking – also soaked in a little baking soda in water as recommended by Cook’s Magazine for tenderness. They are not “Cornish” tender but again they are not as tough as other non-Cornish roosters I have butchered. They were not tastier than the Cornish either. Right now I have a flock of White Dorkings which were THE meat bird in the l800’s before Cornish Crosses made the scene. Their meat is described as very juicy and tender – so we’ll see! I plan to keep 2 roosters, all the hens and butcher the rest of the roosters for the freezer. I am going to get Silver Backed Dorking chicks this Spring as they are a little heavier than the White Dorkings – and so my experiment continues. So far don’t think there is any breed (or cross breed) that can match the Cornish Cross for tenderness or taste. Will post again when I butcher and cook my first Dorking rooster in a month or more! Stay tuned, haha! We are trying to come up with a breed that we can breed to our very large roosters to produce a meat bird. We do not want to butcher those hens, but incubate the eggs and raise chicks to butcher. Right now we have one very large cornish cross rooster and one large plymouth rock rooster. We also keep a flock of layers, mostly Rhode Island Reds. We cannot buy cornish X’s, because they must be butchered before they begin laying. Any ideas?? You could try ordering some Cornish hens. My friend Linda is trying Silver Grey Dorkings as a meat bird. She is waiting to see how big they get. 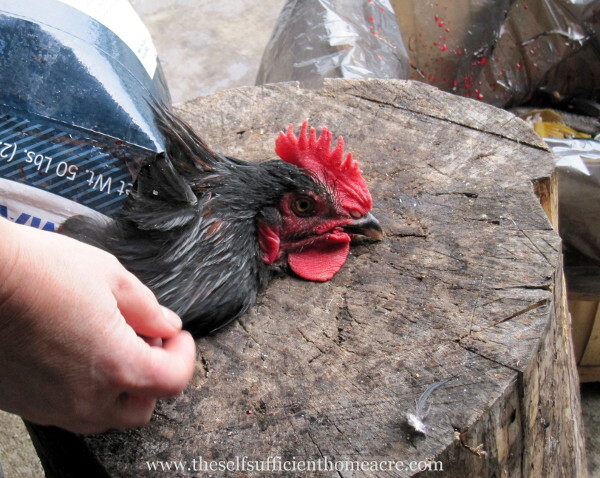 I just came across this post a little late to the party, but I wanted to chime in about your difficulty removing the pin feathers from your Black Broilers (or any breed): curved kelly forceps work great for the ones sticking above the skin. The feathers that have not broken the surface of the skin yet can be popped like a zit. I learned that trick apprenticing on an organic farm that raised 1200 Cornish X broilers during the season, and they were all more content than the people! I have decided not to order them anymore, mainly because of the conditions at the hatcheries where they are raised. hey Lisa, Just an update. We butcher all our meat birds this last weekend. It was an experience for sure. We ended up with 13 birds all between 2 and 3 pounds. What is your experience with heritage breed hens/roosters? How big do you say they averaged? I am wondering if it is normal or if I need to do something else to bulk them up a little. Awesome job, lady! Congrats on your first butcher session! That’s about the size that my heritage chickens were when I butchered them. You can keep them longer, but they will be tougher. You can also try feeding them more protein and fat to ‘beef’ them up a bit. But they will never be as big as the ones you buy at the store. I think my stewing hens might be a little bit heavier…at least the larger breeds are. But they are pretty much only fit for stewing or pressure cooking. I have an order of meat chickens coming this week, but I think it might be the last batch that I raise. I really hate buying from the hatcheries. Most are not humane in their treatment of the chicks. However, I’ve just read that Sandhill Preservation hatchery is a no chick kill facility, so I will be looking into them soon. Hi just to add to this — City girl moved on an acre 5 years ago. Got 10 Cornish crosses from Wilco free with food purchase. Grow very fast, stinkier then our regular egg layers – we fed them twice a day in the morning and at night. Let them have their own pasture with a canopy to sleep under and a couple other shaded corners. They did great, butchered them at 3 months small turkeys – everyone is amazed at the wonderful meat and the size. They had a great three months, much bigger then our regular chickens but very similar in action. Felt sad about the short life span but know they had a much better life then most. They did get really big, really fast. Would recommend it, not too many, the butchering was not our thing, but the freezer full is wonderful. Raising some Dorkings now we’ll see how it goes. Wow! 3 months is old age for Cornish x! I can imagine that the did look like little turkeys 🙂 I think the pasture is very important for them to have a more normal life. Glad to hear that you’ve had a good experience…thanks for sharing! The two names are used interchangeably. The Cornish chicken rooster was bred to a White Plymouth Rock hen to come up with the original meat hybrid, a Cornish X Rock (Cornish crossed with ‘Rock’). But the hatcheries and meat industry have further hybridized these birds to come up with a faster growing, meatier bird that is still called the Cornish X or Cornish Rock, short for Cornish X Rock. It’s an industry secret as to what other breeds are used to raise these meat birds. Thank you Lisa and Linda for answering my questions. I really appreciate your imput. The reason I asked was 20 plus years ago a very citified girl (me) who knew NOTHING about raising chickens – raised the best meat chickens ever to be had by us. They were huge. Small turkeys is a better description of them. They were “Cornish rock” according to the famers supply. Well in the next 2 years we will be moving out of California and hope to homestead. I want to raise meat birds again. This time with a lot more knowledge. So I wondered if I should get Cornish Rock or Cornish X. Sounds like they are of the same. Thanks again for the information. Sorry the previous post was from CJ – somehow I did not come up. Happy to help CJ 🙂 You are correct…the Cornish X is often called the Cornish Rock, from the days when the most popular meat chicken was a cross of the Cornish and the Plymouth White Rock. Best wishes with your move to a homestead! Linda, I hope you’ll share your experiences with us when you finish out your experiment! One thought on the cost of raising Cornish X’s for meat – they are usually $2 plus each then you pay about $15.00 if not more for shipping. Then there is all the feed to be purchased since we don’t raise our own. The only break I have discovered is buying the chicks at our local Tractor Supply in the Spring. they had them this year for $l.99 each and of course there is no shipping to contend with. Kind of wish I had bought some as they were sold out quickly – but am committed now to incubating the eggs of the Black Cornish rooster and my White Rock hens to see what develops. If they do not get to a good size by Fall, I can always order a few Cornish late in the year for roasters since they only take 8 weeks. So shop locally folks if you can and save the shipping costs. I’m all for raising your own if you can. And there isn’t any money saved when raising cornish x unless you raise your own grain, which I can’t. We decided to only eat humanely raised animals…and that is the biggest reason for our family. If the cost is too great, we eat less meat. Very good points for people who are hoping to save money by raising their own chickens. Wow, I think this is such a tough issue, which is why we haven’t yet raised chickens for meat. I personally worked on a chicken farm and I can tell you, it is worse than anything you see in a movie. I have very strong feelings about the Cornish X and what that bird represents to chicken farming in general. On our acre, we are looking hard at what the end goal is and trying to work within that. That being said, I think we all have to just do what is best for our family and the situation our family is in. That’s the beautiful thing about what we are all doing, we get to learn and work towards our family’s needs and goals….and support each other in those endeavors. I bet it was worse than anything we’ve seen. That’s why I raise my own chickens for meat. It’s tough to kill them, but it would be harder for me to buy it at the store. I’m not crazy about how the chicks are raised in hatcheries, and I’m also not crazy about sending my money to an industry that raises the cornish x…but I have to pick my battles. In our current location I can’t raise my own chicks…our coop has Marek’s disease and that makes it really difficult to hatch and raise to eating size. So I order the chicks vaccinated for Marek’s and hope for the best. Best wishes and thanks for commenting. It’s nice to see an article like this that is not so vehemently against the cornish cross. My first year I raised 50 “dual purpose” birds–straight run. What a mistake that was. I’m so glad when the cornish X roosters are out of there before they get real roosterish. Lol 🙂 I think a lot of people mistakenly think that the cornish x are genetically modified and are some kind of freak. In my experience the really do act like chickens, just grow a lot faster. If they have pasture and a clean coop, room to move…then they have a humane life. I like getting them dressed quickly too. I’ll still eat the heritage breeds, but prefer to have some cornish x in the freezer for roasting! We’ve got heritage birds – silver grey dorkings – and we’ve grown them for pot and eggs. At 25 weeks we still haven’t seen any eggs from them and only 1 has the coloured comb showing she’s close to egg laying maturity. And we only have 1 rooster who would be possibly a decent roasting size. It’s our first year too so I’m still getting in my sizing eye when they have their feathers on. We also have 2 other roosters, 1 dorking and 1 a bargain australorp we were given, both of whom are at maturity but will be small meat fare. Economically they are already costing the same price of what we pay here in Australia for an organic and probably technically free-range (not pastured) bird so the economics aren’t there. I have a friend who has bred up her own meat breed and we will buy some of them and probably some cornish cross for next year. It’s just too pricey raising dorkings for meat. I think that what people used to do is let the chickens just clean up after the other animals and free range. I’m sure laying hens were given extra feed, but most eating birds were expected to find their meals. That and raising your own grain would be two ways of making heritage birds less expensive. I’m hoping someday to have room to raise more feed…but for now, chickens ain’t cheap! Thank you for this post! I so want to raise meat birds and will most likely raise the Cornish X, especially at first. I hear Naked Necks make for good eating too, but are a bit slower to finish out. I have some dual purpose laying birds right now. My thing is getting up the guts to do the deed when it comes time!! Thanks for the great information Lisa! We are getting Cornish X this summer for the first time and this answered lots of my questions. Happy to help, Grace! Good luck with your chickens! Thank you so much for this information!!! We are starting our, much anticipated, chicken farm this summer and your site was very helpful and encouraging!!! Thanks for taking your time to help guide us newbies!!!! I’m very happy to share, Myla! Best wishes with your chickens and I hope you’ll stop by and let us know how everything goes this summer! Happy Homesteading! We’ve got 25 icky chickies in a brooder in our shop right now. Cornish X are our primary meat chickens. Roosters that our layers raise end up “parts” chickens, as opposed to the meaties (Cornish). The meaties are the only ones that make really nice roasting birds, IMO. Ours spend a couple weeks in the brooder, and then go outside in chicken tractors. We butcher at 8-8.5 weeks. We eat the extra roosters too, although we don’t have any right now. Yes, I think all other birds seem best for slow cooking and then picking the meat for soups and casseroles. The X are the only ones I really like for roasting. Gosh, the ones I’ve raised acted much more like normal chickens. 🙂 I never saw any of them just lay around and eat! I wonder if it depends on what hatchery you order them from? I have ordered them from several different hatcheries. Try to find a hatchery that is fairly close to you, or pay extra for express shipping to reduce the time your chicks spend in the mail. Sunray is close to me and has very good prices, Whelp has free shipping so the price they list is what you pay, and I’ve had pretty good success with Ideal. You can also check with your local feed store to see if they will have cornish x chicks for sale. Best wishes! We just bought a flock of heritage birds as a sustainable, dual-purpose flock. When we had a flock of Cornish cross the weather failed us, and everybody in the area who were raising them. Massive heat wave two years ago. So we can’t compare. But I like the idea of letting my hens raise subsequent generations of dual-purpose birds for our eggs and the meat as well. We decided on wyandottes. I know they’re decent layers. It’ll be a while before we find out how they do on the table. The Wyandottes are beautiful birds! I haven’t tried them for meat, so I can’t say. I’m planning to get my meat chicks soon so they will be in the freezer before the weather gets hot. I have enough trouble keeping my layers alive in the heat, much less the meat birds. This will be our first year for meat birds. Well, technically, it’s our first year for any chickens. We started raising them last September. We now have 8 laying hens and 1 rooster. We will get 22 more hens this Friday, seven of which will be added to our existing flock of hens. The rest will be meat birds. Thanks for this information. It does help tremendously. I’m glad to share my experience and any info I have. I’m glad to hear that it helps. 🙂 I’m looking forward to hearing about your chickens! I hope you have a great experience! Nice post, Lisa! It’s always good to hear the comparisons and success stories. We have raised Freedom Rangers for the past few years and have a batch of chicks coming next week. We’ve never had CX so we can’t make a personal comparison. The FRs are easy to raise and fit into our free range system really well. They forage most of the day and have a low mortality rate. We aim for 11-13 week processing age for fryers but kept one batch for 16 weeks. We’ve also stewed some at over a year old–they are super soupers. FRs have narrower breasts than CX and their thighs can be huge. The meat texture and flavor are different from store CX, but again, we can’t compare to homegrown CX. In any case, it’s a good feeling to know exactly what went into your chickens and how they were raised. This makes me want to try the Freedom Rangers at least once so I can compare. The homegrown Cornish X were not quite as tender as the store bought, in my experience. I chalk it up to the fact that they have pasture to roam. But they are still more tender than the heritage breeds I’ve eaten, by far. We’ve also done both and are also going back the to Cornish X this year. We tried the Freedom Rangers and were disappointed with how tough these ‘rangers’ were. I credit that to how mobile they are (even flying out of the pen) compared to the Cornish X. We’ve also been doing some research in raising our own Cornish X. It’s a Cornish rooster with a White Rock hen. But…I’ve read it’s still tricky business. Thanks for sharing. I started thinking that I really should try raising the Freedom Rangers so I can compare, but I have never seen them listed for a reasonable price. I order my Cornish X from Sun Ray or Schlect and they are so much less than most hatcheries. I’ve always had good results with them. Best wishes with your chicken endeavors! We have ten acres so perhaps we could grow some of the grain??? although we also want to grow some of *our* grain too so I don’t know. We will butcher them ourselves ~ that is the plan. Right now I pay about $6-10 for a chicken at the local natural foods store. One thing about growing grain is that you don’t have to thresh it for the chickens if you’re not grinding it. You can chop down stalks and they can pick off what they want to eat. I think they enjoy the gleaning process anyway 😉 In the right storage situation you could hold some for winter. We haven’t planted any grain but have some growing in our fields. It is actually a riot to watch the chickens jumping up to reach the heads of standing grain! Lol! I’ve seen my hens jumping up to eat the seed heads on tall grass…you ain’t kidding Marie! Hysterical! I also get a kick out watching them take off on a full run…cheap entertainment, I tell ya! I think they would be living more closely to their natural ways if you don’t glean too. Jenny, $6 – $10 is pretty close to what my chickens cost me by the time I pay for the chicks and all the feed. That’s butchering on my own. Feed cost went way up this year too. I managed to get it on sale a couple weeks ago and bought enough to raise my next batch. I really wish I had room to grow the grain and bring the cost down. I’m going to try raising at least some of the corn. Just a question (love your blog by the way), what types of grains are good for chickens, and I like the idea of allowing them access to the spot to feed on after it is cut down. I have room to grow plots – any ideas?? 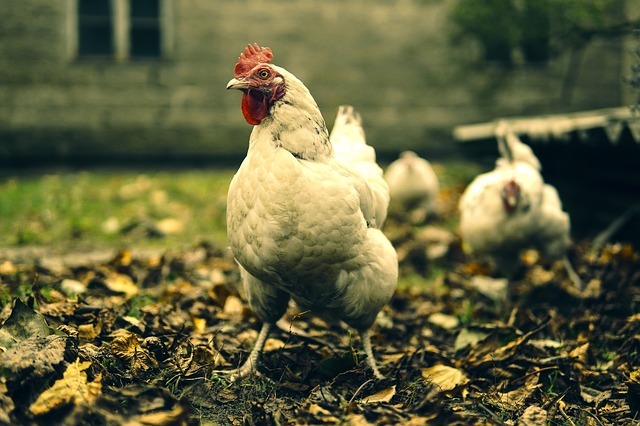 Chickens will eat and enjoy wheat, barley, corn, oats, and most any of the cereal grains. I think corn is one of their favorites, but it is pretty fatty. They also love sunflower seeds, also rather fatty. But since they are foraging for the grains they shouldn’t get too overweight. If you are raising laying hens, make sure that they have a sourcer of calcium too…such as crushed oyster shell. Have never riased meaties as they don’t have normal chicken behaviors and think that’s cruel. I’m getting dual breeds and will hopefully raise some babies from them next year for the freezer. After raising the Cornish X and allowing them pasture, I can say that they acted fairly normal. I also gave them a bit less feed and gave cracked corn as a treat, so they didn’t grow as fast. I know it is possible to give them a more normal life. The biggest reason I raise my own meat chickens is because of the horrid conditions animals are subjected to in factory farms and slaughterhouses. So if I felt that raising the meat birds was inhumane, I wouldn’t do it. Having said that, they are much lazier, and hungrier, than regular breeds. I agree with everything you have said about the taste and tenderness of the Cornish X even though a lot of people rant and rave about them being “abnormal, untasty etc.” I heartily disagree – I don’t think they can be beat for juiciness, taste, tenderness etc.. I have raised them for several years to put in the freezer and wanted to try and come up with the crosses involved to have my own chicks. But I was told by the editor of Countryside magazine that these crosses were developed from the l940’s from several breeds and it would be impossible to attempt. Still – being always hopeful I bought Black Cornish straight run chicks last summer (which are poor layers) as well as White Rock and Buff Orpington hens. This past month I squestered the Black Cornish roosters with some of my White Rock and Buff Orpington hens. Also have a BO rooster and sequestered him with the White Rock and Buff hens in hopes of more egg laying birds. Am incubating the eggs now and will be interested to see if there is any advantage (meat wise) with the Black Cornish roosters crossed with the White Rock hens. I plan to put the extra Black Cornish roosters in the freezer. They don’t seem meaty like the Cornish are but they do have very strong looking wide set legs (maybe this is the first stage of the breeding cross?). I am not hopeful since I’ve been told I’m on a fool’s errand, but I sure would like to be able to raise my own meat chicks instead of paying out $2 each plus about $20 shipping each year. With all the feed they eat it sure adds to the cost of each bird. Well I guess I’m a fool too then 😉 Because I would like to try raising my own meat birds also. Right now I can’t, for several reasons…I don’t have the room to keep the breeding stock, I have diseases in my flock that make it necessary to give vaccinations (not cost effective to do on my own), and I can’t raise the grain to feed them. I think that would also make it more costly to raise the breeding stock. I would be very interested in hearing about your experiences and I wish you the best of luck with the meat bird experiment! pls, inform me as to how the breeding process is coming along as I find it quite interesting and would like more info. Thanks for the encouragement, Kyla! Why isn’t taking the chicken’s life concidered to be horrid and inhumane? We (most of us) would never do that to a human, and every animal holds their own life as dear as we do. We need to eat, it’s a fact of life. Moreover, humans are omnivores, meaning we need animal proteins and fats for optimum health. At least home-grown chickens get to live a happy, healthy existence prior to being dispatched, unlike their commercial counterparts. And as long as the machete strikes true, the dispatching is so instant that pain signals never make it to the brain. Very true, Agnes! Thanks for the comment! At this point, it is a contract between humanity and the livestock. Chickens as they are now, are not likely to survive as a species. Humans are omnivores, though extremely aware, hence the disgust for cruelty. The question to aid in this debate of meat vs. veg is, what is life to you? I believe when I die, (hopefully) my body will replenish the earth. These lives I take will sustain me. Death is unavoidable. I raise rabbits and chickens for my own meat source, and have to accept the darkness of murder along with the light of life I support and encourage. Don’t ever forget that there are two sides to one coin. I chose to accept and face my dark side so as to live a full life as a human being. Choosing to eschew meat, though, has its own rewards. ALL OF YOU WONDERFUL PEOPLE MAKE SO MUCH SENSE ABOUT CHICKS AND MEAT AND EGGS. INHUMANE IS JUST THAT. BUT, REMEMBER WE ARE THE ANIMALS GOOD AND KIND STEWARDS AND THEY WERE CREATED FOR ALL OF US TO NOURISH OUR LIVES. KNOWING THIS REALLY HELPS WITH THE KILLING PART OF THE LIFE, FOR ME ANYWAY. YEP, I HAVE HAD CHICKENS FOR EGGS FOR 27 YEARS AND NOW HAVE A HOUSE TO RAISE MEAT BIRDS. THANKS SO VERY MUCH FOR ALL OF YOUR COMMENTS AND HELP. GOD BLESS AMERICA. We are are at the too of the food chain for a reason. Every omnivore eats another animal and I think you should remember our heritage. Please stop with feeling that chickens are like people because they are not you are not talking about monkeys or dolphins here. Chickens don’t know who they are or where they are. Kill one and let the others watch. Hold food out in your hand and they will eat it. Not so smart are they? If every life is as dear to you as your own how can you bear to even exist. We can’t drive down the road without killing thousands of bugs, check the grill and radiator of your car. A simple walk across the lawn kills hundreds of creatures that value their lives as much as we do I suppose. Not to mention all the creatures big and small that must die to grow enough veggies to feed and sustain a vegetarian. If I kill fifty chickens a year to supply my family with healthy meat it’s a small drop in the bucket compared to the lives lost when you drive to the movies to watch Bambi. Think a bit before condemning me and my meat eating friends. If you’re a vegetarian just because you think it’s “less” cruel, Think again. I was reading recently about how rainforests are being clear cut to produce more soybeans…a staple food for many vegetarians. The same is being done to produce palm oil…killing orangutans by wiping out their habitat. It would seem to me that the best course of action for a person who cares about animals would be to eat only what they grow. But this is not an option for so many. Our family is trying to reduce what we purchase, and one of the ways we do this is to raise our own chickens for eggs and meat. I do feel bad when I kill any animal that I raised, but I feel worse about buying the meat at the grocery store or fast food joint…because I know that those animals suffered throughout their short lives. My feeling is that it is much easier to think in a linear fashion, rather than to think in a manner that takes into account the myriad of information available to us, because it is so difficult to keep track of all that info. And if you only think about the feelings of this one chicken, it’s easy to see why someone would feel bad for the chicken. But to realize that the life of this one chicken is worth sacrificing in order to prevent the destruction of rainforest in the Amazon takes a more all emcompassing throught process…something we humans seem to be losing the abiltiy to do. If you truly wish to prevent cruelty to animals, you would acheive that best by raising as much food as you can, and purchasing the rest from small local farms where the farmers believe in treating their livestock as humanely as possible. I will second Lisa’s, comment. Cornish are very lazy, eat like a pig, are messy, but I find them to scratch on the ground when its given to them, I also find fermented feed to work well for them. I will also point out something Lisa, left off. I am not sure if its 100% or just a very high percentage, but when you purchase store bought chicken or turkey, they are on a medicated feed. I am not sure how you feed your birds, but I feed 100% non medicated from birth to process age. If you never watched the movie “food inc” you really should rent it, or buy it on Amazon. Good point about the medicated feed, Larry. At the time that I wrote this, I was feeding my chickens non-medicated, conventionally grown feed. I have since switched to organic feed. It is difficult to find a high protein organic feed, but I supplement with split peas, sunflower seeds (in winter) or other sources of protein. That has been our experience also. Cornish X raised in portable pasture pens that are moved daily do just fine. Nothing “inhumane” about it. 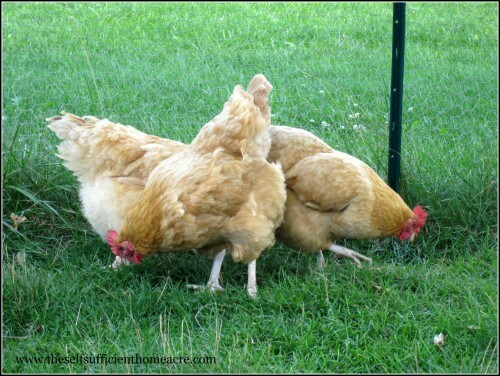 Fresh grass (and bugs), sun, shade, fresh water, food= happy life= tasty clean chicken for the family.